Our Attorney General Schneiderman Proposes Sweeping Legislation To Reform New York State Government. One question that you may ask is how short is the term limit request from our AG Schneiderman. Well, the answer is infinite because term limits does not seem to be mentioned. But our AG Schneiderman did propose "salaries increases" for our representatives. This may be a good thing if kept within reason and if all "per-diem" and slush funds are eliminated. Think about it, if you commute to work, no one pays your commute expense but yourself. Should not your representative do the same? 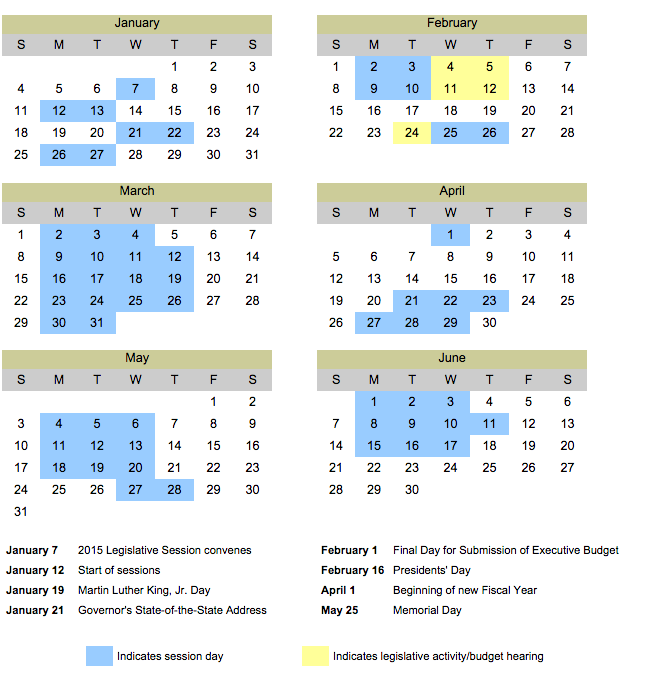 And here's your representative's session calendar. Yes, you would be correct to ask where is July through December? It appears that time has no sessions. Let's take the proposed $174,000 salary for our representatives. Given the 58 session days. That is $3000 / session. Also if we generously assume a 4 hour session. See http://assembly.state.ny.us/av/session/ That would be $750 / hour. Of course, we must assume that our representatives are working for the people they represent most of the rest of the time during the year. I highly recommend that you call and visit your representatives office and give them assignments and followup with them and everyone in your community on their diligent progress. Ask yourself this: "What if you where the representative and your current representative was your constituent, how would they treat you?" I have a feeling they would be quite demanding and quite critical. You have the right and duty and obligation to do the same for yourself and your community and your future and your family's future. Did you realize that, it appears, we, the taxpayers, pay for settlements involving our representatives when they are found guilty. Mr. Lopez, 71, was first elected to the Assembly in 1984. After resigning, he will continue to receive an annual pension of $64,634.28, which he began collecting in 2011 through a loophole that allows some lawmakers to receive a legislative salary and a pension simultaneously. And our AG Schneiderman wants to give them pay raises? Tell https://twitter.com/agschneiderman what you think.